It’s that time of year when we’re eagerly waiting to celebrate, with great devotion, the birth of the elephant-headed Lord Ganesha, deemed the Lord of prosperity, auspicious beginnings, and the remover of obstacles. Also referred to as Ganapati, Vinayaka, Binayak, and Pillaiyar, Lord Ganesha has countless followers in India and abroad, and hence his birthday is celebrated with much fervour around the world. Spread over 10 days, the high-spirited festival of Ganesh Chaturthi, also known as Vinayaka Chaturthi, is commemorated with artistically designed idols, glimmering lights, and cheerful music. The auspicious occasion falls on shukla chaturthi of the Hindu month of bhadra (between August and September). The festival is celebrated with the inauguration of clay idols of Lord Ganesha at homes and in public places. On this day, everyone comes together to offer their prayers to the divine Lord and share happiness with one another. 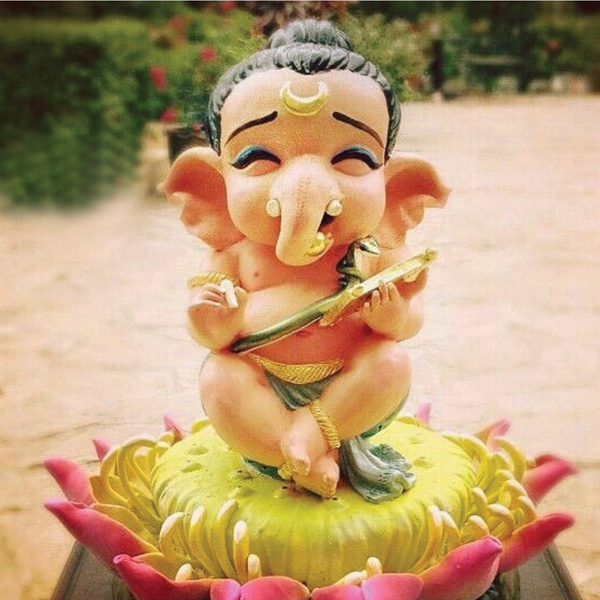 But have you ever wondered about how our little Ganesha came to life? Most of us have heard about the age-old story associated with the birth of Lord Vinayaka while growing up, but there are actually two different versions of his birth. One has it that Goddess Parvati is the creator of Ganesha. It is believed that a long time ago, while Lord Shiva was away fighting the demons, Goddess Parvati was alone. One day, she needed someone to watch her house while she was going for a bath, and so she created Lord Ganesha using sandalwood paste and her powers to bring him to life. Parvati then asked Ganesha to guard the house while she was bathing. Shiva returned home, only to be stopped by little Ganesha. Out of anger, Shiva severed the head of Ganesha. A furious Parvati ordered Shiva to bring her son back to life. Shiva obeyed the orders and re-created Vinayaka by placing an elephant’s head on the body. This is how Lord Vinayaka is referred to as the elephant-headed god. However, Parvati was still quite unhappy, so Shiva granted Ganesha a blessing that before people start any new task they must worship him. Hence, he is often referred to as the god of auspicious beginnings. Another version of the birth of Lord Ganesha says that on the request of the Devas, Lord Shiva and Parvati created Ganesha to protect the Devas from obstacles. Like any other god, according to the Hindu scripture Mudgala Purana, Lord Ganesha is worshipped in 32 different forms. Of all the forms, the most widely worshipped ones are Bala Ganapati, Bhakti Ganapati, Siddi Ganapati, Vighna Ganapati, Heramba Ganapati, Lakshmi Ganapati, Vijaya Ganapati, Sinha Ganapati, and Durga Ganapati. We explain some of these popular forms ahead. Bala Ganapati is regarded as the first among the 32 different forms of Ganesha. As the name suggests, the elephant-headed god is depicted as a child in this form – in a seated posture. This form of Ganesha is also shown as a baby who is either sleeping or crawling with his tiny legs. Many a times the Bala Ganapati is red in colour, similar to a rising sun, signifying the harvest season. This particular form of Ganesha holds different food items like banana, mango, jackfruit, and sugar cane in hands, as each of these symbolise the earth’s fertility and abundance. His trunk holds his favourite sweet, the Modaka, pointing in the direction of his mouth. This form of Ganapati is the third among the 32 forms. During the harvest season, this Ganapati shines like a full moon, as he is white and adorned with flowers. Bhakti Ganapati is nothing but a devotee form of Lord Ganesha. It is depicted as having four arms, each holding a banana, coconut, mango, and a bowl of sweet pudding (Kheer). Worshipping this form is believed to relax the mind, solve problems, and bring immense joy. This form is mostly worshipped on Ganesh Jayanti, Putra Ganapati Vratam, and Sankashti Chaturthi. The 31st form, this is one of the most popular characters of Lord Ganesha. Here the divine god is shown paying tribute to Goddess Durga. It is believed when the idol is deep golden in colour it symbolically holds a red flag, a flag of victory over darkness. Lord Ganesha is shown as having eight arms, holding a bow and an arrow, noose and goad, prayer beads, rose apple and broken tusk. In India, Shri Mahalakshmi Temple in Kolhapur, Maharashtra is famous for the Durga Ganapati idol. Out of the 32 different forms, Lakshmi Ganapati is the 12th form of Lord Ganesha. Lakshmi is considered to be the goddess of well-being and prosperity. In this distinctive form, Lord Ganapati is shown with two of his companions – Siddi and Buddi – seated on each of his thighs.Goddess Buddi is for wisdom and Goddess Siddi is responsible for achievement. Lakshmi Ganapati is white and is seen with eight hands. In each hand, the divine lord holds a green parrot, a sword, pomegranate, elephant goad, sprig of Kalpavriksha (wish-fulfilling tree), a noose, and water vessel. The left hand is in an abhayamudra posture, denoting that he is offering his blessing to devotees. Praying to this god helps his devotees attain materialistic gains along with prosperity and intelligence. The famous Lakshmi Ganapati idol is found at the Lord Muruga hill temple in Pazhani, Tamil Nadu. One of the popularly worshipped forms of Ganapati, this is the 13th form of Lord Ganesha. As the name suggests, ‘Maha’ stands for great, and this form holds special significance. The Maha Ganapati has similarities with Lord Shiva. Just like Shiva, he too has three eyes and a crescent moon on his head. The single-faced Ganapati is bright red and has 10 hands. This form of Ganapati is seated royally with one of his consorts on his knee. Each of the hands hold a sugarcane bow, some paddy, a mace, a pomegranate, a lotus, a blue lily, chakra, tusk, noose and ratnakumbha (a pot with precious gems). It is believed that worshipping Maha Ganapati bestows devotees with prosperity and helps devotees succeed in their respective fields. The Krishna temple at DwarakaI known for its Maha Ganapati idol. This form of Ganesha is also found in paintings in Thiruvananthapuram. Heramba Ganapati is the 11th form of Lord Ganesha, and is considered a rare form in that he is depicted with ten hands and five heads. His main right arm is in abhayamudra pose, which indicates that he is offering his blessings to all his devotees, while the left hand grants all the wishes. In the other hands, he holds Rudraksha (Japa Mala beads), a hammer, an axe, noose, broken tusk, garland, a fruit, and his favourite sweet, Modaka. According to Sanskrit, the ‘He’ in Heramba means helplessness or weakness, and ‘Ramba’ means protection. Hence, worshipping this particular form is believed to give strength to the weak and help them overcome fear. The Heramba Ganapati also blesses people with skill, knowledge, and judgement to accomplish their goals. This rare form of Lord Vinayaka is worshipped in the Kashi Vishwanath temple at Varanasi, Uttar Pradesh. On the auspicious occasion of Ganesh Chaturthi, You & I got in touch with a few ladies from the city to find out about their beliefs in the god of prosperity, and how they celebrate the festival. A homemaker and an entrepreneur who runs an embroidery and tailoring unit, Aparna is a firm believer of Lord Ganesha, so much so that she visits the famous Siddhivinayak Temple in Mumbai whenever she visits the city. Every year on Ganesh Chaturthi, Aparna brings home a clay idol of the lord and decorates it with flowers, haldi, and kumkum, and prepares a prasad that she places in front of the idol. She performs pujas wherein she reads the Ganesh mantras and performs aartis twice a day until she immerses the idol at her own home. She puts the dissolved clay in her plants at home thereafter. Sharing her fond memories of the festival, Aparna says, “I remember keeping all our study books neatly near the idol, and also pulling our ears and asking for forgiveness and guidance. 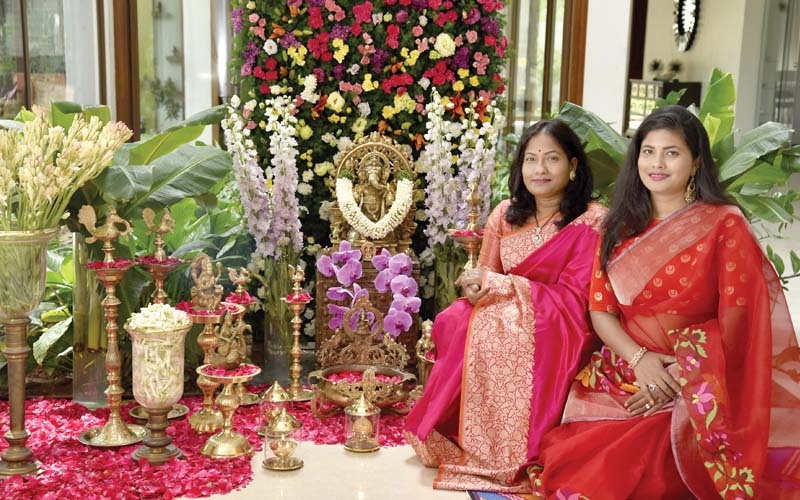 I would make my daughters do the same.” The mother of two grown daughters, Rashmee and Nikhilaa Prakash, Aparna tells us that she gets the love for Lord Ganesha from her parents and in-laws, and is therefore passing it down to her children, too. 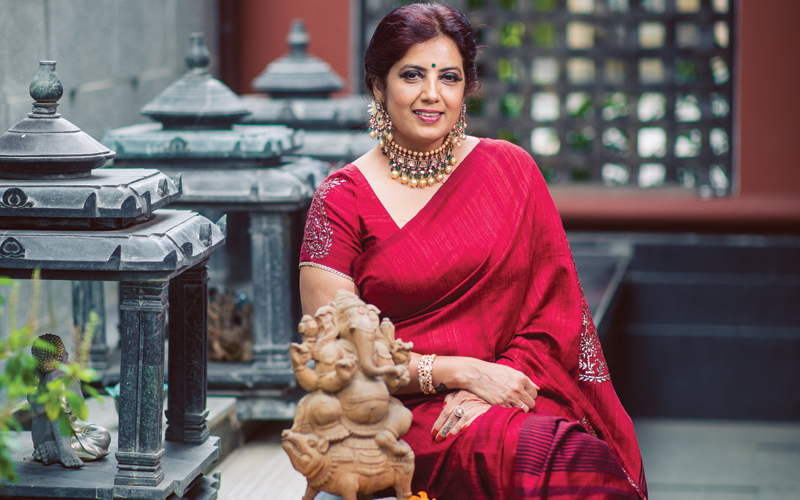 An interior designer by profession and a homemaker by choice, Sahiti is a true-blue believer of Lord Ganesha. “He looks adorable yet has a fierceness that inspires confidence and strength,” she says. Of all the forms of Lord Ganesha, Sahiti likes the Sleeping Ganesha as it reflects her philosophy that you can be relaxed yet get things done effectively; you don’t need to be worked up to be a star. Her favourite festival, Ganesh Chaturthi, is celebrated with much fervour at her home every year. It is one of the most important festivals for her family. Sahiti enjoys listening to the tales told by her mother-in-law on this day. She tells us, “Ganesh Chaturthi is my son’s favourite festival too; the preparations, the idol, and the stories excite him. Now that he has grown up, we have become more responsible and optfor eco-friendly idols.” Sharing her fond memories of the festival, Sahiti says that her father used to take her brother and her on his scooter to buy the idol, patri, and sweets every year. The jostling and intense haggling at the market excited her. She therefore insisted that her husband took her son for Ganesh Chaturthi shopping as a kid. Having always dreamt of being an actor, Sarayu Roy was lucky to have gotten a chance to do a few Punjabi music albums, which in turn led her to do some short films for the web. These got her a lot of fame and made her a known name in television and on the big screen, too. Currently working for a series called Ninnepelladatha for Zee Telugu, Sarayu also has three films that will start this month. For the actress, Ganesh Chaturthi has always been a big celebration. The positivity that the festival brings in unmatchable, she believes. Bala Ganapati is Sarayu’s favourite form of Lord Ganesha, as she is very fond of children. She can spend hours playing with kids. On the day of the festival, the naturelover performs a puja at home, and relishes the Andhra food cooked by her Telugu mother. help weavers flourish in Andhra Pradesh and Telangana. At Parvathi’s stunning house, there is a traditional idol of the sleeping Ganesha, right at the entrance. It is made of wood and is painted with silver by artists from Udaipur. Every year on Ganesh Chaturthi, the Reddy family gets an eco-friendly clay Ganesha. They keep it at home for one to three days, and decorate and worship it. Parvathi’s children put their books in front of the divine god for blessing. On the day of immersion, the family visits their relatives’ and friends’ houses to pray to their respective Ganesha idols. 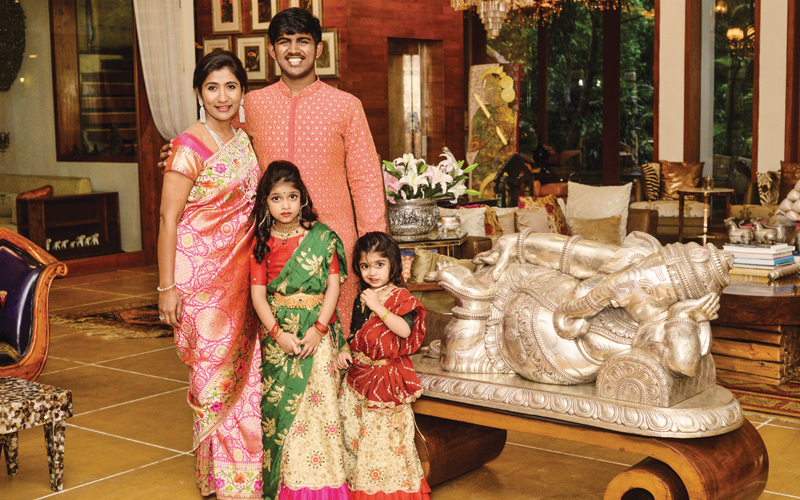 Athulya Reddy is a Hyderabad-based interior designer and mother to two lovely children: Aishwarya and Amay. 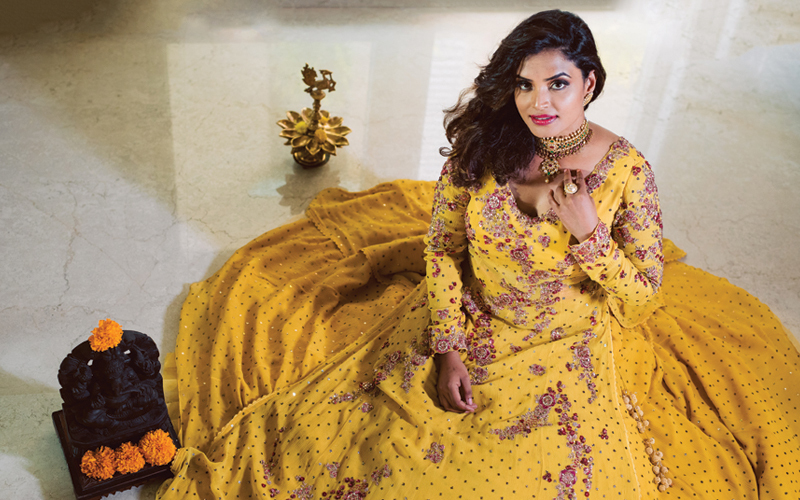 Her husband Kamlesh Reddy is the president of Superior Fragrance Inc. Athulya tells us that she was always inclined towards interior design but put her career aside to take care of her children. Now that her children have grown up, she is back to pursuing her dream of becoming a full-time interior designer. She recently started her own design firm under the name of Athulya Reddy Interiors. 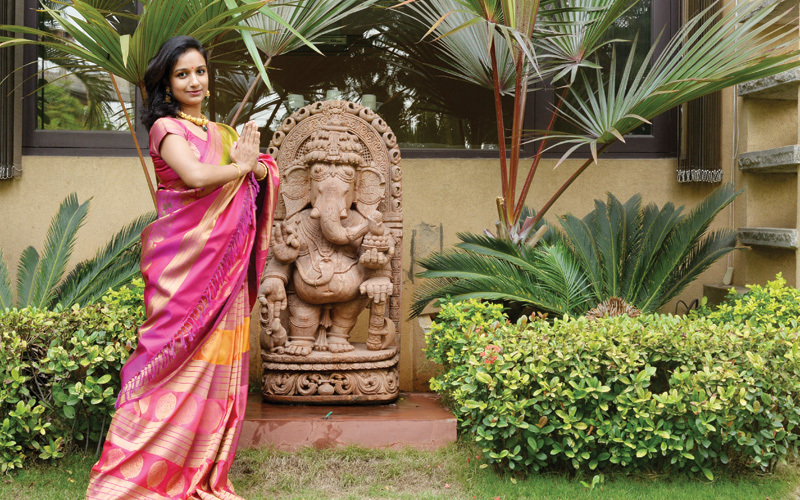 At her lavish home, Athulya has an elegant, yet modern form of Lord Ganesha. The Ganesh is custom-made of composite marble. This handmade piece holds quite a bit of significance for the family as it is the first piece that they bought before they moved into their house. The rest of the house was built around this piece. This sculpture of the divine lord is the focal point of their home, and they strongly believe that it brings peace and serenity. Every year, Athulya and her family celebrate an eco-friendly Ganesh Chaturthi. One of the things that Aishwarya and Amay love to do for the festival is to paint the mud Ganesha idols with non-toxic colours and immerse them in the lake. The family also gathers on the day of Ganesh Chaturthi to enjoy a variety of traditional homemade foods. 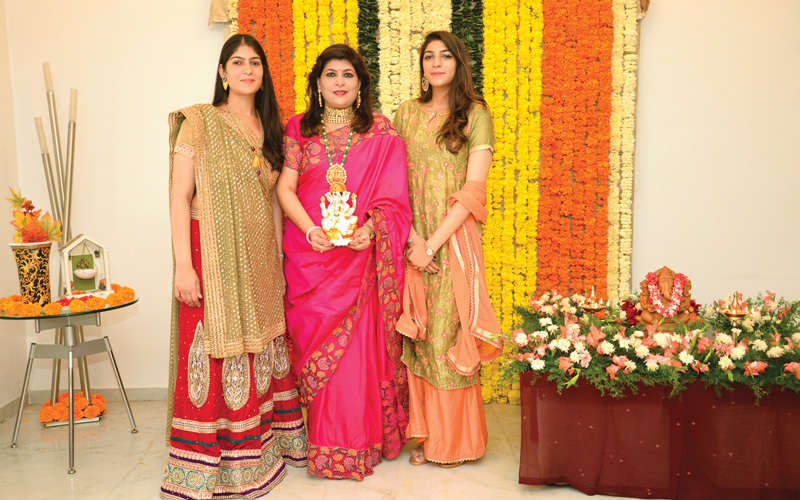 The talented Keerthi Reddy is the founder of one of India’s finest luxury floral brands, OneRoze. In addition, she is the marketing director of her family’s construction company, Keerthi Estates, which was established by her father Kumbam Anil Kumar Reddy. At her home, Keerthi has a beautiful brass idol of Lord Ganesha. This particular form of the divine lord, known as lalitasana, is seated on a lotus throne. It is placed at the entrance of the house, as the family believes it will ward off any negative influences and further instil happiness in their lives. Before starting any new venture, Keerthi and her family worship Lord Ganesha to bless them with strength, courage and success. Every year, Keerthi and her family perform the traditional Ganesh puja on the morning of Ganesh Chaturthi, and call a pandit to perform a traditional puja in the evening. A businesswoman and an active volunteer at one of the leading NGOs in Hyderabad, Madhu Jain belongs to one of the oldest, most eminent families in the city – the Raja Deen Dayal family. She is married to Sandeep Jain and is a doting mother to three beautiful children: Tanishq, Tavishi, and Tanisha. Madhu believes that placing a Ganesh idol should be the first and the foremost activity that all homeowners must do, as it brings good fortune. She has a traditional Ganesh idol made up of white marble in her home. The idol was given to her by her mother during her griha pravesh as a token of blessing. Hence it holds lot of importance to Madhu and her family. It is a sculpture of Lord Ganesha in a meditating posture, seated on a lotus flower. 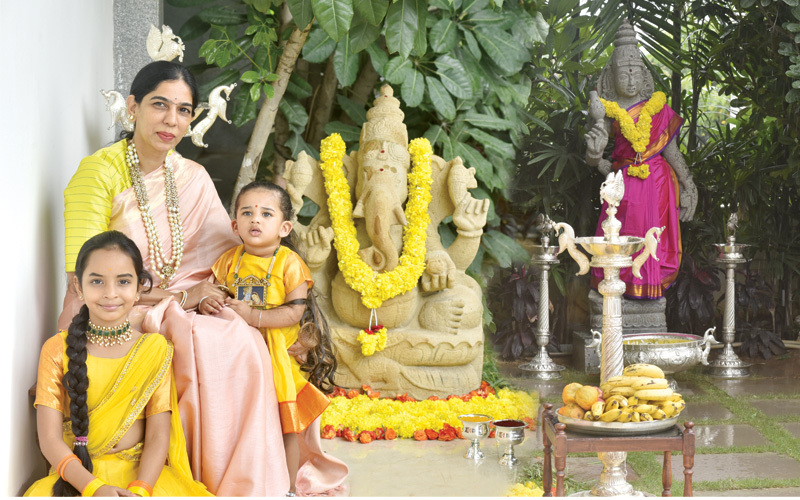 Madhu and her family celebrate Ganesh Chaturthi for five days every year. They bring a clay idol to their home and every morning and evening they perform pujas and offer flowers, Modakas, durva and karanji to the god. The whole family gets into a festive mood and they decorate their house with mango leaves, flowers, and rangoli. This period is also the start of Das Lakshan Parv, the festival of 10 virtues, wherein the family goes to the Jain temple every morning. The last day of visarjan and Das Lakshan is considered very auspicious, as it is the Anand Chaudas or Anant Chaturdashi. 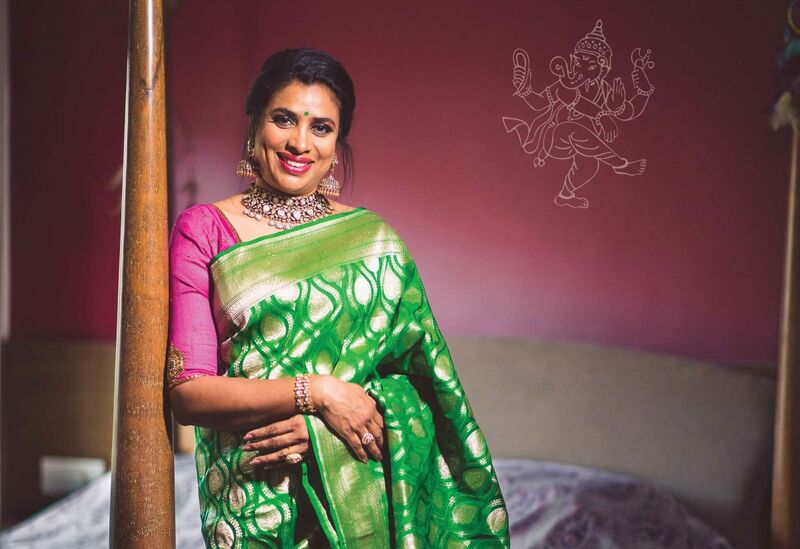 Yamini Reddy is a renowned classical dancer and a devoted mother of a six-year-old-boy, Arjun. Having begun dancing at a very young age, Yamini is a three-time National Award holder for Kuchipudi. Currently, she performs and teaches this beautiful dance form across the globe. While she enjoys her profession, she also likes to read books, watch movies, and spend time with her family in her free time. Yamini has an attractive Bhakti Ganesha idol in her garden. This sculpture is made up of red stone and is originally from Odisha. Lord Ganesha holds quite a bit of significance for this elegant lady, as she considers it auspicious for the house. Even while dancing, she always begins her performance by praying to the lord, as she firmly believes that he is there to remove all obstacles and ensure success. On the day of the festival, apart from performing the regular puja that is done in every household, Yamini prepares a special Kheer and the lord’s favourite sweet, the Modaka. After the traditional rituals, the whole family gets together and enjoys a delicious vegetarian meal. After her son Ridhiman and daughter-in-law Sameksha moved to the US, homemaker Lata Reddy has become more spiritually inclined. Lata has a conventional stone Ganesha idol near the entrance of her elegant house. It sits in the northeast corner. This sitting form of Lord Ganesha is not only used for religious purposes but also as a symbol for creating a calm and composed atmosphere at home. Ganesh Chaturthi is a very important festival to the family, as they believe that worshiping Lord Ganesha before starting any business brings success to the venture. This year the festival will be even more special for Lata because she will be celebrating with her nieces Aishani and Amaira, who have come from the US. 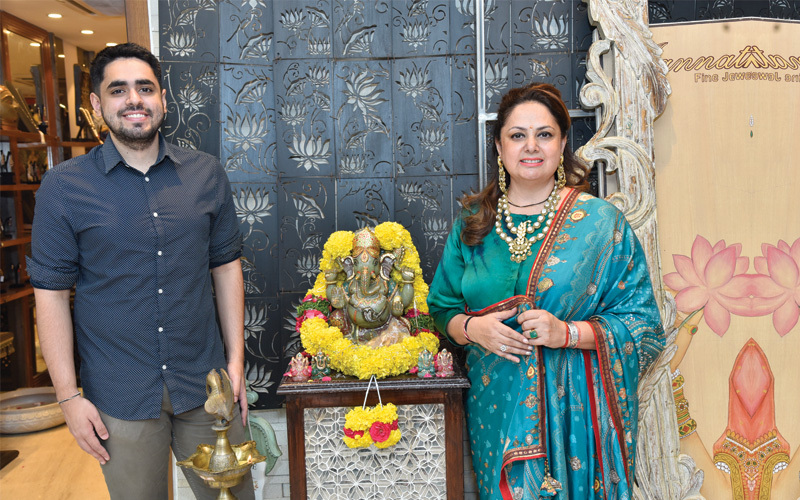 Poonam Choudhari is a successful businesswoman and a caring mother to her two sons Abhishek and Abhinav. She owns a fashion brand called Jannath that deals in precious and semi-precious jewellery and exotic artefacts (made in silver and wood). Poonam has an intricately-carved traditional Ganesh idol which is made from a single block of green jade, and is hand painted in gold paint and other vibrant colours. This idol holds significance in Poonam’s life as she believes that worshiping the sun god Lord Ganesha before beginning any task is very auspicious. 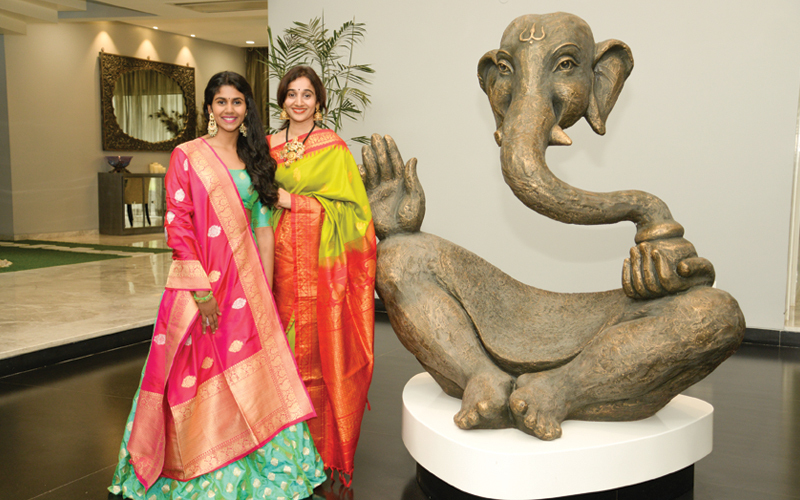 Poonam and her family are ardent devotees of Lord Ganesha. They celebrate Ganesh Chaturthi by purchasing a Ganesha and worshipping it for 11 days. During this period, their house is beautifully decorated with flowers and they enjoy festive delicacies. On the day of immersion, the family performs a special puja.